Lately, I’ve become more flexible with how I structure our meals and less vigilant about making sure Jeremy and I have two vegetables or a fruit AND a vegetable with every lunch and dinner. As a result, meal-planning has become a lot easier and we have been more satisfied with our food. Does this mean that nutrition has gone out the window? Definitely not. Today, I’m getting back into my favorite topic - the practical, day-to-day application of my nutrition knowledge and philosophy. It doesn’t get more practical than how to structure a balanced, nourishing meal without spending a ton of time or getting overwhelmed. That’s it! Each of these categories or food groups provide a variety of nutrients, many of which are not found in other food groups. That’s why including a variety of food groups is so important! 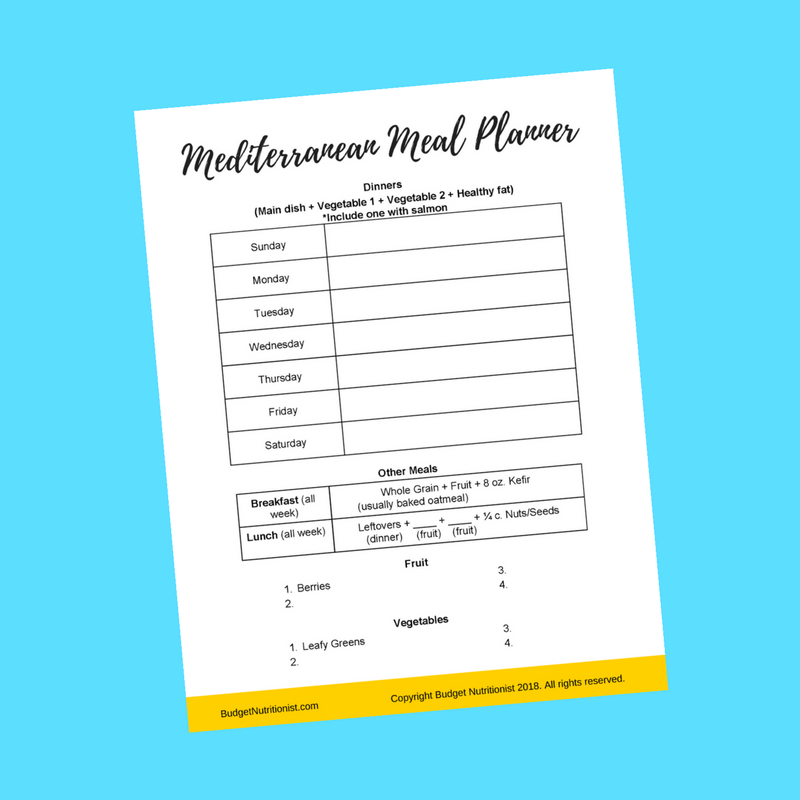 Sign up for my email list to get updates and free resources, including my Weekly Meal Planner! Of course, we do still eat white rice, potatoes, steak, and butter as part of our meals here and there, because this is where variety comes in! As long as most of our meals contain something from each of the food groups I discussed above, I’m really not concerned about nutritional adequacy. Including several food groups in each meal almost always ensures adequate vitamins, minerals, and macronutrients - unless you have a health condition with special nutrient needs. As you can see, there is a mix of foods aligned with the Mediterranean eating pattern - salmon, olive oil, vegetables - and foods not so aligned with it - french fries! This is still a very balanced and nourishing meal which aligns with an overall Mediterranean eating pattern. Breakfast looks a little different for us. Typically, we will just have baked eggs with cheese and vegetables in them, plus coffee with milk (chocolate milk in my case). Other days, we will have baked oatmeal with full-fat vanilla yogurt. Another easy favorite is whole wheat toast with peanut butter. I aim for at least two food groups with breakfast and typically make sure there is a combination of protein, carbs, and fat in order to keep Jeremy and me full and satisfied throughout the morning. Probably the most important thing to mention with all of this is that not every meal needs to be balanced! There are plenty of times when we are going to a party or just having a fun weekend meal and I don’t worry about making sure it is balanced. This helps protect the simple joy of having a fun meal or snack. Jeremy and I like going to our favorite local donut shop about once a month on Saturdays, and we don’t usually have a protein, a fruit, or a vegetable - just donuts and coffee! This is perfectly fine! We also often eat ice cream after dinner a few times a week, but again, it’s not an issue. Isn’t there a saying, “Perfect is the enemy of good”? I believe this is the case with eating. As long as we are eating a variety of nourishing foods the majority of the time, this is more than enough. Our bodies will be healthy and feel good - with few exceptions! On the other hand, if we aim for perfection with every bite and sip we take, we usually won’t gain much in health benefits (over a more balanced approach), but we WILL lose a lot of the pleasure of eating. What are your thoughts on loosely structured meals? Do you have a pattern or structure that you base most meals around? Share in the comments about what works or doesn’t work for you! Also, what do you think about aiming for “good” instead of “perfect” with food? Does this resonate with you? I can’t wait to continue the conversation with you in the comments! Sign up for my newsletter to get updates and free resources, including my Weekly Meal Planner!